Cannon bunes carry few crewmen and are no match for heavy ships in terms of manpower or size. Instead they are designed to act as “skirmishers” where their size is an advantage: their guns can do immense damage to an enemy vessel’s hull or crew. The bune’s oarsmen can put on a burst of speed for a short time, if needed. The sides and roof of the cannon bune are covered in thick bamboo, with small holes for the cannon to poke through, making it impossible for enemy soldiers to board it. Medieval Japanese naval warships could be classified into three weights: heavy, medium and light. Light ships were primarily used for scouting and communication missions, and were considered too small for battle. The Tokugawa clan did create a hybrid ship for their siege of the Osaka coastal fortress in 1615. It was small and light but also functioned as an assault ship. 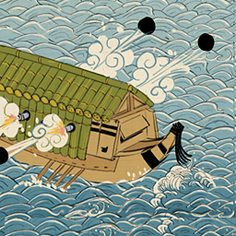 Based on the kobaya ships, this new type, the mekura bune, or ‘blind ship’, had fewer oarsmen to make room for additional cannons and archers. The bamboo protection covering it resembled a shell, drawing comparisons with the Korean’s famous ‘turtle ship’. This increases the reload skill of a ship's crew for a short period of time. This increases a ship's rowing speed and lasts considerably longer than the battle speed ability. Late game but no match for European ships.